Rescuers are using computer models to try to find three missing boaters, including two NFL players, off the Florida coast Tuesday, the Coast Guard said. One of the missing men was rescued Monday, but the search for others passed the 48-hour mark earlier Tuesday. Oakland Raiders linebacker Marquis Cooper, NFL free agent Corey Smith and former University of South Florida football player William Bleakley went missing Saturday after leaving on a fishing trip. “It’s just gut wrenching, and it’s just left me zapped of any energy,” Marquis Cooper’s father, Bruce Cooper, said Tuesday. “I know this, he’s a fighter,” he said, adding that his son was an undersized linebacker both at the University of Washington and in the NFL. “He doesn’t back down. He’s just an extreme fighter. What I’m holding on to is that he’s out in the water right now, just fighting.” Marquis Cooper loved being on the water and was an experienced boater, his father said. Bruce Cooper had recently taken a 14-hour fishing trip with his son. Watch Bruce Cooper say that his son loved fishing » “I just told him I didn’t feel comfortable looking in all directions and not seeing land,” he said. “We laughed and joked about it. That’s just who he is. It’s his love.” Former USF football player Nick Schuyler was found Monday afternoon clinging to a small overturned fishing boat. He was about 39 miles west of Egmont Key, Florida, sitting atop the overturned 21-foot boat and wearing a life jacket. His mother Marcia was the first to see him in the hospital, she told WTSP-TV, a CNN affiliate in Tampa-St. Petersburg, Florida. He is being treated for dehydration and hypothermia, his parents said. “He told me, ‘Mom, I kept saying you’re not gonna go to my funeral.’ He said that’s what kept him hanging on,” Marcia said. “He was so dehydrated he was semiconscious. He did not really talk,” when his family first saw him, said Schuyler’s father Stuart Schuyler. “The only thing he did say was: ‘Hi, Pops. '” Watch Nick Schuyler’s father overjoyed that his son is safe » Schuyler told his Coast Guard rescuers that the men’s boat was anchored Saturday evening when waves overturned it, said Coast Guard Capt. Timothy M. Close. Schuyler told rescuers that all four men clung to the boat for a time but then became separated, Close said. Rescuers flew a C-130 plane and sent out three boats and two helicopters equipped with thermal imaging technology in the hopes of finding the missing men. 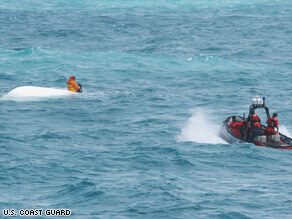 The seas had calmed a little bit, which may help the rescue effort, a Coast Guard spokesman said. Based on what Schuyler told the Coast Guard, officials were able to narrow the search from 16,000 square miles. Watch Schuyler being moved on a stretcher » Schuyler last saw his three friends at 2 a.m. Monday, his father told WTSP on Monday. The three were wearing life vests. See photos of rescue » The four boaters embarked in the single-engine boat from the Seminole Boat Ramp near Clearwater Pass about 6:30 a.m. Saturday, the Coast Guard said. The search was launched early Sunday after friends and relatives realized the four had not returned. Cooper was aware of Sunday’s weather forecast and for that reason picked Saturday for the trip, his wife, Rebekah, told WTSP on Sunday. “Fishing is his first love, it always has been,” she said, “I have a lot of faith in him out there.” Watch relatives, friends express concern for missing boaters » Smith and Cooper were teammates with the Tampa Bay Buccaneers for part of the 2004 season when Cooper was a rookie, according to the NFL’s Web site. Smith, who entered the league with Tampa Bay in 2002, went on to play for the Washington Redskins before moving to the Detroit Lions for the 2006 season. Cooper has played for six teams in his five-season career. Bleakley lettered from 2004 to 2006 as a tight end for the University of South Florida, and Schuyler was a walk-on defensive end in 2006, but he never played in a game, according to a spokesman for the university’s athletics department.